Written 20 years ago, Richard Shannon’s play has been revived to commemorate this year’s 400th anniversary of the Pendle Witch trials. The cast of four works hard to conjure up a sense of this community and the period but, like a broken broomstick, it never really gets off the ground. Magistrate Roger Nowell (Robert Calvert) is a self-important boor who, when his son is stillborn suspects the woman who tended his wife had a hand in it – literally. Chuck in some wild accusations from a lively beggar girl (Nisa Cole) and things are soon spiralling out of control. People (mainly women) are tried and executed because their superstitions contradict the prevailing institutionalised superstitions. Except they don’t. Calvert believes in God and angels; the ‘witches’ are supposed to believe in the Devil and demons. It’s like deciding which side of the Force you’re going to use. It’s disturbing to think that people will use superstition as a means to ruin people’s lives. But this was four centuries ago. In our modern, enlightened world that no longer happens – touch wood. That’s what I took from this production: a rather depressing view of humans. There are still those who cling to superstition ahead of fairness, kindness and common sense. The main problem is it has all been done before and done better. Arthur Miller’s classic The Crucible overshadows this play. That was a metaphor for the McCarthy anti-communist trials of the 1950s. 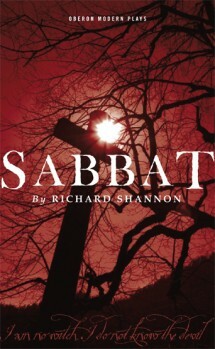 Sabbat is less direct in its relevance. As a local history piece and one-for-the-tourists, it (like its characters) has good intentions but I found it lacking in local colour. Now on the road, away from its native Lancashire, it needs to bring a stronger flavour of that county to the rest of us who are not fortunate enough to live there. The dialogue is that heightened form of English you get in period pieces, devoid of slang and idiom. There is a lot of verbiage to wade through. “It was dark. There was no light,” Calvert explains at one point. The language seems to weigh the characters down. It’s all a bit po-faced. Even in the few lighter moments, they’re all so earnest. I would have liked to see a bit of frivolity and liveliness before the trouble started in order to make the contrast with the darkest moments more effective. There is some evocative singing in between scenes and the cast is an efficient if joyless ensemble. One scene stood out for me. Alice Nutter (Christine Mackie giving the strongest performance) has been arrested and charged. Calvert conducts her interrogation, trying to elicit a confession. Here is the crux of the play. An innocent woman caught in the wheels of his belief system. Alice details in a speech of beautifully dark imagery what the consequences of pursuing Calvert’s beliefs will be, describing the decay of the bodies in the gibbets that will line the roads. It is a moment of real power and energy – a woman speaking out against the injustices of the male-run system. At last, I thought, we can see what these actors are capable of. The execution is staged symbolically, with headscarves being hoist on hooks. It seems like a bit of a let-down. I wanted something a bit more brutal and harder hitting to finish the thing off, after the late promise of that powerful scene. I left the theatre wondering if a documentary-style approach would have made the experience fresher, more immediate and more involving.